From M6 - Exit Junction 28, turn right and proceed to lights. Turn right along A49 towards Wigan. Continue straight on until reaching a mini-roundabout. Proceed straight ahead for 50 yards and turn right into Euxton Hall Gardens. The nearest mainline station is Euxton Balshaw Lane. This is approximately 5 minutes walk from the Hospital. 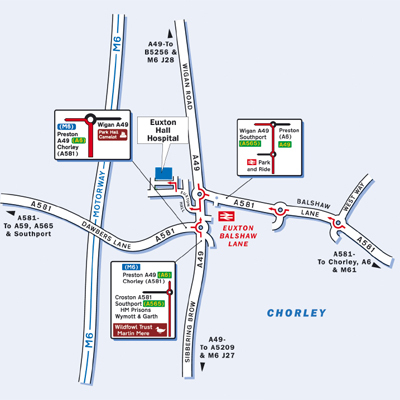 GMPTE - a wealth of information on different route plans to get to all of our hospitals. Virgin Trains - enter your travel details on the front page of their site. Manchester and Liverpool airports are about 30 minutes drive away. We can also arrange for you to be collected from the from the airport .